Let MC² in Agriculture engage your students and help them master the science and math they need for success in high school and beyond! 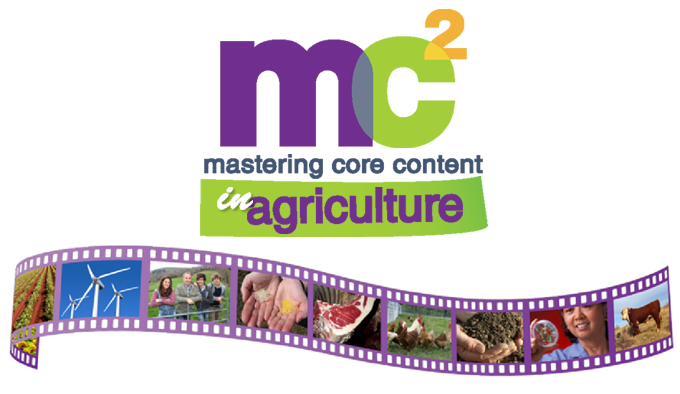 MC² (Mastering Core Content) in Agriculture focuses on STEM skills in the following areas: Animal Science, Plant Science, Soil Science, and Environmental Science. The series of engaging videos and accompanying activities and assessments is built from state standards, AFNR standards, Common Core Standards, and Career and College Readiness Standards. The program provides teachers and students with an easy-to-use framework for spotlighting core content, especially science and math, that is integral to the Agriculture career cluster. *MC² video lessons require the Microsoft Silverlight plugin to view the videos. Please use Internet Explorer to view the videos as this plugin is no longer supported by other browsers. The Silverlight plugin is a free download with a relatively low download time. Silverlight will not have any undesired effects on your computer. The plugin is a trademarked product of Microsoft, and no other software is installed when you download directly from Microsoft's Silverlight page. If you click on the video icon and a new window with a grayed out player appears with the message "Install Microsoft Silverlight", this means Silverlight is not installed on your machine. Please visit http://www.microsoft.com/getsilverlight/Get-Started/Install/Default.aspx to download Silverlight and follow the installation instructions. After this process is complete, you will be able to view the MC² videos.